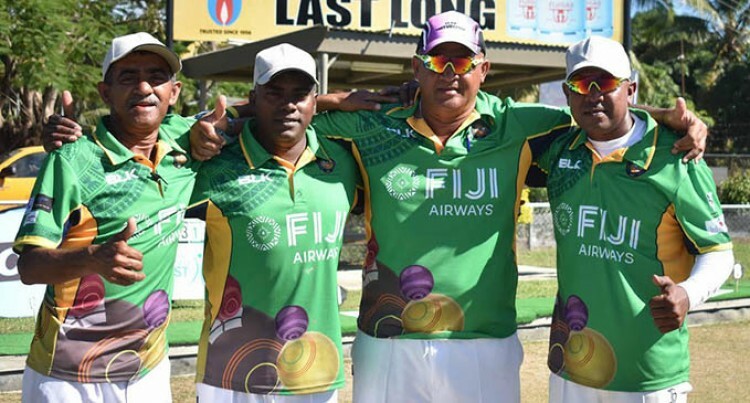 The David Aitcheson skippered Team Sheraton were crowned winners of the 10th Fiji Airways Sunny West Bowling Carnival Fours event at the Nadi Sports and Social Club yesterday. The side also had the services of national reps Arun Kumar, Rajnesh Prasad and Kaushal Pillay as they beat Team Williams & Gosling 15-13 in a very close match as both teams went into the last end drawn 13-13. A lovely trail by Prasad who picked up two for Sheraton that remained till the end. “It was a tough competition having overseas bowlers but we had an interesting team with national and former reps which proved to be the winning formula,” Aitcheson said. Team Williams & Gosling had the likes of Bobby Prasad, Santokh Singh, Sitiveni Tikoisuva, and Dan Vinod. They beat Sai Tokalau’s team of Ratish Lal, Semesa Naseruvati and Sunia Laveti 12-10. Team Sheraton also beat last year’s runner-up Team Lillydale of Victoria, Australia (Jan Thaggard, Cameron, Troy and Stephen) 13-11. Abdul Khalim’s team retained the plate title with a 10-7 win over Kanda Sami’s team from Lautoka in the final. Tournament chairman Rick Eyre said there were interesting clash on the final day. “It was a pleasure to watch some fine skills under lovely weather conditions exposed at this tournament by the local teams and our visitors,” he said. The pairs event starts today at 8.30am.